One aspect of today’s event is the dedication of a financial laboratory to help students learn about financial markets, which I think has great value. Knowledge of how financial markets operate is an important aspect of financial and economic literacy, and it leads to greater financial security over time. For example, one important lesson is that when the promised returns on an investment offering are extraordinarily high, it is because the investment is either very risky or fraudulent. When investing, it is important to remember that if it seems to be too good to be true, it likely is! Today, I want to take the opportunity to talk about the importance of financial markets in influencing the economic outlook and, in turn, U.S. monetary policy. This is a subject near and dear to my heart. Nearly 20 years ago—when I was working in the private sector—my colleagues and I introduced an index of financial conditions.2 I believe that my long-standing focus on financial conditions has, over time, helped me become a better economic forecaster. And, I am pleased that economists and analysts increasingly incorporate financial conditions into their assessments of the economic outlook. As I will argue, financial conditions in the United States play an important role in influencing economic conditions. Because movements in financial markets are a major factor influencing broader financial conditions, it is necessary to understand how financial market developments can affect the economic outlook and, therefore, the appropriate setting of monetary policy. But, this story gets more complicated, as the setting of monetary policy, in turn, affects market developments and financial conditions. This two-way feedback is an important feature of the interaction between financial conditions and monetary policy. In the conduct of monetary policy, the FOMC does not have targets for either specific components of financial conditions or for financial conditions more broadly. We care about financial conditions not for themselves, but instead for how they can affect economic activity and ultimately our ability to achieve the statutory objectives of the Federal Reserve—maximum employment and price stability. Let me provide a few examples. A decline in mortgage rates can lift the demand for owner-occupied housing and support construction activity. A rise in equity prices can boost household wealth, which is one factor that underpins consumer spending. The foreign exchange value of the dollar can affect the relative competitiveness of importers and exporters, which, in turn, influences the country’s trade performance. Narrower credit spreads can reduce the cost of capital for business and help support greater business investment. In sum, financial conditions affect households’ and firms’ saving and investment plans, and, therefore, play a key role in influencing economic activity and the economic outlook. This is why the evaluation of financial conditions is so crucial in the conduct of monetary policy. The FOMC traditionally implements monetary policy by adjusting the federal funds rate—the short-term interest rate paid by banks that borrow reserves from other financial institutions. However, few economic decisions directly depend on the federal funds rate. 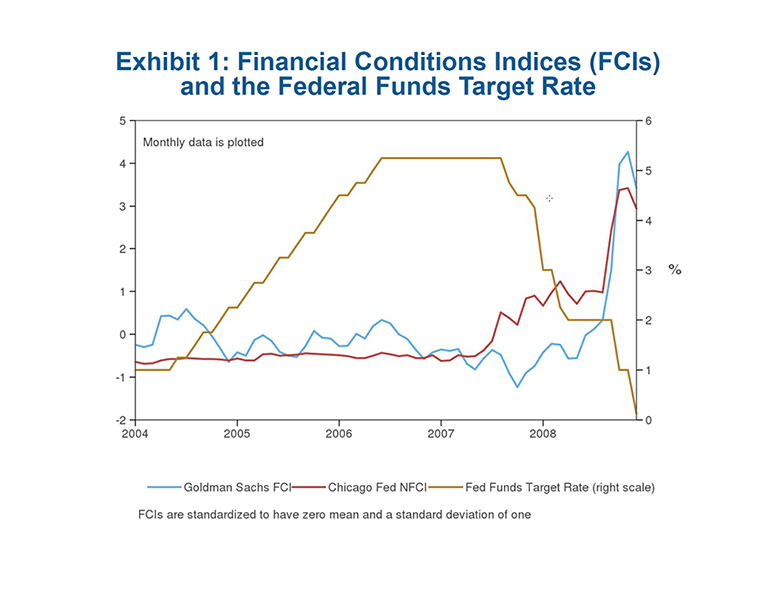 Rather, changes in the federal funds rate affect the economy through their impact on other interest rates, which, consequently, influence broader financial conditions. If financial conditions moved predictably with the policy rate, then there would be no need for the FOMC to focus on financial conditions. In such a world, by adjusting the level of the federal funds rate, the FOMC could be fully confident that it could generate the appropriate financial conditions necessary to support achievement of full employment and price stability. In fact, the response of financial conditions to changes in short-term interest rates is not rigid and predictable. Instead, as we shall see shortly, the linkage between the federal funds rate and financial conditions changes over time, as it is influenced by a whole host of other factors. Recent evidence suggests that even the relation between short-term and long-term rates has shifted substantially over the past 15 years.4 Moreover, at times, we have observed cases in which financial conditions did not move in the same direction as the monetary policy stance. Let me highlight two recent divergences which indicate that we need to keep a separate eye on the evolution of financial conditions. The first occurred in the mid-2000s. In June 2004, the FOMC decided to begin raising the federal funds rate target in order to remove policy accommodation. It raised the target in 25-basis-point increments at 17 consecutive meetings, pushing the rate up from a starting point of 1.0 percent to a peak of 5.25 percent. Despite this tightening of monetary policy over two years, financial conditions failed to tighten in a similar manner. This can be seen by looking at the behavior of well-known measures of financial conditions during this period (Exhibit 1). The rise in short-term rates was offset by a decline in long-term yields, a rise in equity prices and narrower credit spreads. In contrast, there have been times when financial conditions tightened even as the FOMC reduced short-term interest rates. For example, consider what happened during the heart of the financial crisis. Even as the FOMC lowered the federal funds rate in the fall of 2008—eventually hitting its effective lower bound that December—credit spreads widened sharply, household and business loan underwriting standards tightened sharply, liquidity in many financial markets dried up, and the U.S. stock market plummeted. Financial conditions tightened despite the aggressive easing of monetary policy during this period. There are many explanations for why the relationship between the federal funds rate and financial conditions is so variable. Without being exhaustive, let me highlight three. First, animal spirits in financial markets wax and wane, pushing asset values up or down in a manner that can more than offset the effects of movements in short-term interest rates. The movements in many financial markets following last year’s presidential election are a notable example of this phenomenon. Second, domestic financial conditions are influenced by what happens abroad. If the monetary policy of major U.S. trading partners becomes easier relative to policy in the United States, then it could lead to a dollar appreciation that would weigh on U.S. trade performance, all else equal. Third, financial instability and stress can cause risk-averse investors to increase their demand for safe assets. This can push up risk premia and credit spreads, and push down stock prices—which can more than offset the impact of an easier monetary policy. Divergences between short-term interest rates and financial conditions often appear to be larger and more persistent in the United States than in most other advanced economies. There are several reasons for this. First, the U.S. financial system depends less on its banking system to intermediate financial flows than in other countries. 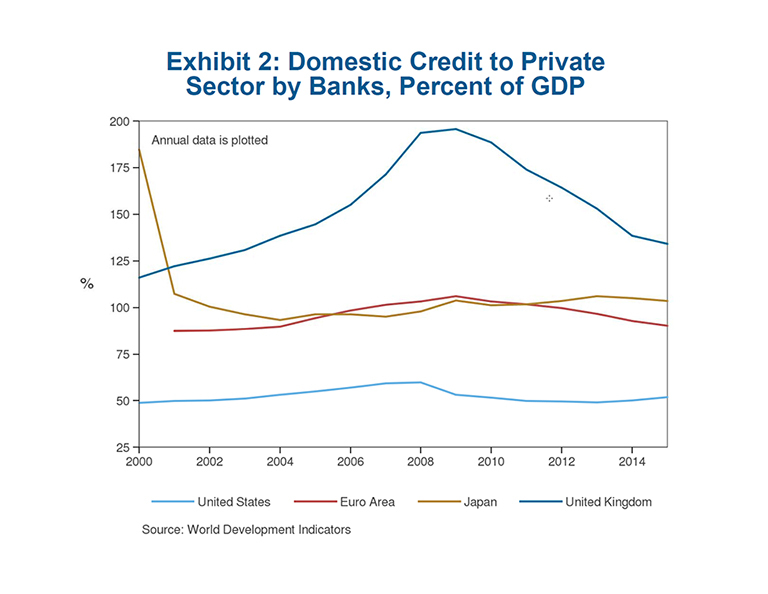 The share of credit supplied by the banking sector fluctuates around 50 percent in the United States, which is much lower than in the euro area, Japan and the United Kingdom (Exhibit 2). Second, in contrast to most other countries, U.S. residential housing is financed mainly by 30-year fixed-rate mortgages, rather than—as is the case in most other countries—adjustable-rate mortgages with rates that much more closely track their central banks’ short-term interest rate targets. Third, the equity market plays a much more important role in the United States than elsewhere. 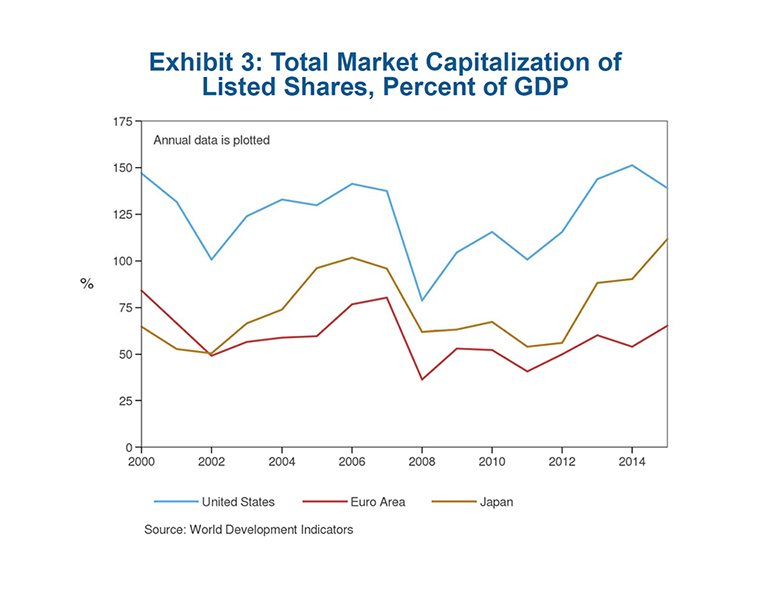 The total market capitalization of the U.S. equity market is considerably higher than in the euro area and Japan (Exhibit 3). Because the evolution of financial conditions can diverge from the path of the federal funds rate, financial conditions need to be carefully considered in the conduct of monetary policy. However, I want to reiterate that what we care about is not financial conditions themselves, but rather their influence on economic activity. Accordingly, we should care much more about longer-term movements in financial conditions than about higher-frequency, transitory movements. That is because behavior in firms and households will be influenced much more by how financial conditions evolve over time, rather than by where they happen to be at a particular moment. To emphasize this point, let me give two contrasting examples—one where financial conditions moved sharply but not persistently, and another where financial conditions moved systematically over a longer time period. We will see that it is the long-lived movements that have the largest influence on the economic outlook. A contrasting example is the sharp appreciation of the dollar that began in 1978 and reached a peak in March 1985. The persistent strength of the dollar had a significant negative consequence for U.S. trade performance. Our trade deficit widened sharply in 1985 and 1986, which contributed to the sharp slowdown in U.S. manufacturing production growth—and a milder slowdown in GDP growth—over this period. This leads to an important question: When should the FOMC take changes in financial conditions into consideration in its conduct of monetary policy? I don’t think there is a simple answer. Financial conditions matter in influencing the economic outlook, but so do many other factors. It is true that monitoring financial conditions can help improve the effectiveness of the policy decision-making process. However, as I hope is clear from my previous examples, there is no mechanical link between policy rates and financial conditions that monetary policymakers can systematically rely upon to set policy. Another key question is what one should focus on in assessing financial conditions. Again, I don’t think there is a simple answer, as the significance of any particular aspect of changes in financial conditions depends on the economic circumstances and environment. In the early- to mid-2000s, the combination of looser mortgage underwriting practices and home equity withdrawal were major financial factors contributing to that economic expansion. The subsequent housing crash was exacerbated by the sharp reversals of mortgage lending standards and home equity withdrawal, which together contributed to the severity of the Great Recession. Today, these factors seem less important because lending practices in the housing market have been much more stable in recent years. The importance and complexity of financial conditions also underscore the need for caution in following any mechanical monetary policy rule. For example, the most well-known rule—the Taylor Rule—does not explicitly take financial conditions into account in terms of its monetary policy prescription. In that rule, the federal funds rate depends only on the deviations of output from its potential and inflation from the Federal Reserve’s 2 percent objective, and on the level of the real short-term interest rate consistent with a neutral stance of monetary policy. Because the interactions can shift between financial conditions and the economic outlook—as well as between financial conditions and the federal funds rate—the absence of financial conditions in this rule can cause it to perform poorly as a guide for monetary policy. As a case in point, consider what the 1999 variant of the Taylor Rule indicated as the appropriate monetary policy setting in September 2008, just prior to the failure of Lehman Brothers. In the Bluebook document that the Federal Reserve Board staff prepared for the September 2008 FOMC meeting, the 1999 Taylor Rule called for a federal funds rate setting of 3.5 percent for the fourth quarter of 2008, well above the 2 percent setting at the time of the meeting. The standard 1993 Taylor Rule—which puts a greater weight on inflation—called for an even higher federal funds rate target of 4.1 percent. Given the rapid deterioration in financial conditions, instead of following the prescription from these rules, the FOMC cut the federal funds rate rapidly over the next three months, pushing the federal funds rate down to a range of 0 to a quarter of 1 percent by year-end. Also, requiring the Federal Reserve Chair to explain frequently why the FOMC had deviated from a particular rule would unduly impinge on the ability of the FOMC to conduct monetary policy in a manner insulated from short-term political considerations. Of course, Congress has the right to hear from the Federal Reserve about its conduct of U.S. monetary policy. There are already several opportunities, including regular testimony and semiannual monetary policy reports. If Congress desires, such communications could become more frequent or enhanced. But, my point is that these exchanges should not be triggered by deviations from a mechanical rule. And, of course, I feel that this is especially true for a rule that does not account for financial conditions. Now that I have expounded upon the importance of financial conditions, I would like to discuss their implications for the current stance of U.S. monetary policy. As I see it, there were a number of factors behind the FOMC’s decision in March to take another step in gradually removing accommodation by raising the federal funds rate target by 25 basis points to a range of three quarters of a percent to 1 percent. Most importantly, the economy has continued to grow modestly above its sustainable long-term pace. This has led to continued, sturdy monthly job gains and a gradual diminution of the amount of slack in the U.S. labor market. Forward-looking indicators foreshadow a continuation of this trend. For example, household and business confidence has increased markedly over the past few months. The economic outlook abroad also appears to have brightened. Growth has picked up in Europe. Commodity prices have risen, reducing the pressure on emerging market economies that are major commodity exporters. There are still significant uncertainties and risks abroad, but overall, these risks seem significantly lower than they were a year ago. Inflation has moved closer to our 2 percent longer-run objective. Headline inflation on a year-over-year basis has moved up in the past few months as the sharp declines in energy prices in late 2015 and early 2016 have fallen out of the calculation. Core inflation—which ignores the more volatile movements in energy and food prices—also has moved slightly higher. Over the 12 months through January 2017, the core personal consumption expenditure deflator has risen at about 1.75 percent, up from 1.6 percent a year earlier. Thus, I have become more confident that inflation will stabilize around the FOMC’s objective over the medium term. While there is still considerable uncertainty about fiscal policy and its potential contribution to economic activity, it seems likely that it will shift over time to a more stimulative setting. Consequently, it appears that the risks for both economic growth and inflation over the medium to longer term may be shifting gradually to the upside. Even after the latest increase, the federal funds rate target range at three quarters of a percent to 1 percent is still unusually low in both nominal and inflation-adjusted terms. While most FOMC participants judge the equilibrium short-term real interest rate that is consistent with a neutral monetary policy to be low—perhaps in a range of 0 to 1 percent—this is still above the current inflation-adjusted federal funds rate. In such circumstances, it seems appropriate to scale back monetary policy accommodation gradually in order to reduce the risk of the economy overheating, and to avoid a significant inflation overshoot in the medium term. Finally, prior to the March FOMC meeting, financial conditions were generally easing rather than becoming tighter, even as the FOMC raised its policy rate in December and market participants increasingly expected further policy tightening in the coming year. Between the December and March FOMC meetings, U.S. equity prices rose by about 4 percent, and credit spreads, such as those for high-yield bonds, narrowed. Long-term yields and the trade-weighted dollar were little changed over this period. Before I conclude, let me make a few comments about the Federal Reserve’s balance sheet. As you are undoubtedly aware, the Federal Reserve dramatically expanded the size of its balance sheet during and following the financial crisis to provide accommodation to support the economy when short-term interest rates were constrained by their effective lower bound. Currently, we are reinvesting maturing Treasury securities and agency mortgage-backed securities repayments to keep the size of the balance sheet generally stable. We have said that we plan to continue this policy of reinvestment until we are well along in the process of normalizing the level of the federal funds rate. As the FOMC has raised the federal funds rate three times, this process seems to have proceeded smoothly so far, prompting renewed interest in our balance sheet and reinvestment policy. The anticipation of and actual announcement by the FOMC of changes in reinvestment policy is likely to push up longer-term interest rates and tighten financial conditions somewhat, just as the earlier purchases pushed down long-term interest rates. To what extent is difficult to judge. Presumably, financial conditions would tighten by more if we were to end reinvestments earlier and more abruptly. This suggests a better course may be to taper reinvestments gradually and predictably. In addition, because changes in reinvestment policy will likely tighten financial conditions, we will have to take this into account in our interest rate decisions. My view is that reducing the Federal Reserve’s balance sheet and raising short-term interest rates are two different, yet related, ways of removing monetary policy accommodation. Therefore, I would expect that, when we begin to end reinvestment, we will have to consider the implications for the appropriate short-term interest rate trajectory. In conclusion, financial conditions are important. They matter enormously to monetary policy because their movements can often diverge from the trajectory of short-term rates, and because they affect economic activity and the economic outlook. While it is essential to account for financial conditions appropriately in conducting monetary policy, it is also important not to overreact to every short-term wiggle in financial markets. In addition, it is important to remember that the policy goal is not the level of financial conditions per se, but the achievement of the Federal Reserve’s dual mandate objectives. Sometimes, that will be consistent with easing financial conditions, and at other times, it will be consistent with tighter financial conditions. At all times, our focus will be on achieving our objectives of maximum sustainable employment and price stability, thereby supporting the livelihoods of households and businesses throughout the United States. 1 Ozge Akinci, Nicola Cetorelli, Richard Crump, David Lucca, Jonathan McCarthy, Paolo Pesenti and Joseph Tracy assisted in preparing these remarks. 2 See William Dudley and Jan Hatzius, “The Goldman Sachs Financial Conditions Index: The Right Tool for a New Monetary Policy Regime,” Goldman Sachs Global Economic Paper Number 44, 2000. 3 For a discussion of various financial conditions indexes see Jan Hatzius, Peter Hooper, Frederic S. Mishkin, Kermit L. Schoenholtz, and Mark W. Watson, “Financial Conditions Indexes: A Fresh Look after the Financial Crisis,” U.S. Monetary Policy Forum (Chicago: Chicago Booth Initiative on Global Markets, 2010) pp. 3-59. 4 Samuel G. Hanson, David O. Lucca and Jonathan H. Wright (2017), “Interest Rate Conundrums of the 21st Century,” Federal Reserve Bank of New York Staff Report No. 810, March. 5 Carlson, Mark, “A Brief History of the 1987 Stock Market Crash with a Discussion of the Federal Reserve Response,” Finance and Economics Discussion Series No. 2007-13, Divisions of Research & Statistics and Monetary Affairs, Federal Reserve Board, Washington, DC, November 2006. 6 Janet L. Yellen, “The Economic Outlook and the Conduct of Monetary Policy,” speech at the Stanford Institute for Economic Policy Research, Stanford University, Stanford, California, January 19, 2017.